Here, we show that southern elephant seals (Mirounga leonina) equipped with oceanographic sensors can measure ocean structure and water mass changes in regions and seasons rarely observed with traditional oceanographic platforms. In particular, seals provided a 30-fold increase in hydrographic proï¬les from the sea-ice zone, allowing the major fronts to be mapped south of 60Â°S and sea-ice formation rates to be inferred from changes in upper ocean salinity. 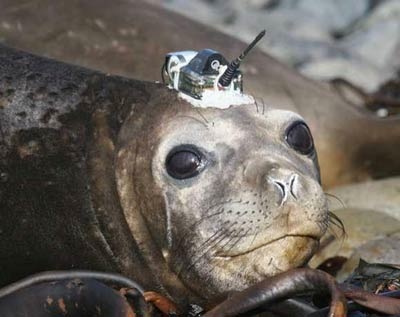 […] By measuring the high-latitude ocean during winter, elephant seals ï¬ll a â€˜â€˜blind spotâ€™â€™ in our sampling coverage, enabling the establishment of a truly global ocean-observing system. Abstract here, full paper here[PDF]. More coverage at New Scientist, e! Science News. Interesting, thanks for the link to the paper. I’ll give it a read. I seem to have found the wrong type of “hat” for my image, though. Yes, but your seal hats are much more David Shilling.